You are here: Home / Blog / What is Non Verbal Reasoning? What is Non Verbal Reasoning? Non Verbal Reasoning (NVR) is a common 11 Plus subject, but it’s not usually taught in schools. Because of that, it’s unlikely that your child will have come across it before they start their 11 plus exam preparation. That’s nothing to panic about, because pretty much every other child will be in the same boat. Here’s a quick guide to Non Verbal Reasoning, the different question types, and how your child can practise their skills. Non Verbal Reasoning revolves around problem solving. However, instead of using words or numbers, these problems involve Non Verbal (the clue is in the name) shapes and diagrams instead. What Skills Does Non Verbal Reasoning Test For? Non Verbal Reasoning tests your child’s logic and critical thinking skills. Non Verbal Reasoning in the 11 Plus exam will test how well your child can apply the above skills to different types of puzzles and problem solving exercises. The skill is quite closely-related to mathematics in terms of which part of the brain it engages. This means that children who are strong in maths are often strong in Non Verbal Reasoning as well. Can Non Verbal Reasoning be Taught? Some children have natural ability in Non Verbal Reasoning, and often report that they can ‘just see’ the correct patterns without much conscious thought. Lucky them! If your child is one of the lucky ones, they will likely sail through this element of their 11 Plus exam. It’s still probably a good idea, however, for them to have done at least a small amount of practice in advance of the test, just so they are familiar with the subject and likely question types. On the other hand, some children really struggle with Non Verbal Reasoning, and report it as their most hated 11 Plus subject. While it’s unlikely that a child in this camp will cross over to the level of children with more innate ability, it is possible for your child to improve in NVR, at least to the point where their score in this area won’t drag down their final exam mark by too much. Practice does not make perfect in Non Verbal Reasoning, but it does really help. By studying the different question types and learning to spot the common different types of patterns, children can train their brains to find similar patterns with more ease in future. Non Verbal Reasoning is hard to teach to a certain extent due to the fact that every question is different, but there are a few tricks and tips that can be employed to make things easier. We teach these techniques to children via worksheets and video tutorials on our online platform. Will There be Non Verbal Reasoning in My Child’s 11 Plus Test? The most likely answer to that question is yes, your child will have to do Non Verbal Reasoning as part of their 11 Plus exam. In recent years, NVR has increased in popularity as an 11 Plus topic. This is at least partly due to the rise in popularity of Durham CEM exams, which use it very frequently in their tests across different regions. GL Assessment 11 Plus exams also incorporate NVR into their exams quite frequently, although not in every region. Independent Schools may contract either GL Assessment or Durham CEM to run their 11 Plus exams, and this may or may not include Non Verbal Reasoning. Independent schools who write their own 11 Plus exams may also include NVR, although this is less common. To find out for sure if your child’s 11 Plus exam will contain Non Verbal Reasoning, head to the secondary schools admissions section of your county council’s website. Or, in the case of independent school entrance exams, head to the admissions section of the school’s website. What Proportion of My Child’s 11 Plus Exam Will be Non Verbal Reasoning? This varies slightly between different regions but, as a rule, Non Verbal Reasoning tends to be the smallest section of the 11 Plus Exam, weighted less heavily than other key subjects. In most regions where NVR is used in the 11 Plus, it will make up between 20 – 25% of your child’s total mark. In Durham CEM exams it tends to be around 20%, and in GL Assessment Exams it tends to be more like 25%, but it does vary., and remember that some 11 Plus tests don’t incorporate Non Verbal Reasoning at all! What Are the Different Types of Non Verbal Reasoning? Non Verbal Reasoning comes in all manner of different question types, but almost all of them are solved by finding a pattern or sequence between different elements of shapes or figures. Complete the Grid: the same idea as Complete the Series, but the pattern could also be moving vertically or diagonally. 11 Plus Exams in certain regions may also include elements of Spatial Reasoning, which is another type of Non Verbal question type. What On Earth is Spatial Reasoning?! Spatial Reasoning is in the same ballpark as Non Verbal Reasoning and uses many of the same skills. The main difference is that, whereas traditional Non Verbal Reasoning involves 2D shapes and patterns, Spatial Reasoning uses 3D elements. In Spatial Reasoning, children need to be able to visualise 3D shapes and manipulate them in their heads. For example, a Spatial Reasoning Question might involve choosing what a 3D shape would look like from above, or what a 3D shape would look like if it had been rotated. Spatial Reasoning is less common than classic NVR, but it is showing up in more and more 11 Plus Exams across the UK. Most notably, the new Buckinghamshire 11 Plus exam administered by GL Assessment includes Spatial Reasoning as an element. As above, you should check with individual county council and/or secondary school websites to find out if Spatial Reasoning will be an aspect of your child’s 11 Plus exam. How Can My Child Build Non Verbal Reasoning Skills at Home? Non Verbal Reasoning is shape and puzzle-solving at its heart, so your child will probably already be working on these skills during play, without even realising they are doing so. A word of advice: if your child already enjoys any of the above activities (or if you start to introduce them at home), don’t tell them that they need to do them as part of their 11 Plus study. Nothing kills the enjoyment of building a lego castle more than having to do it for the 11 Plus! As well as the above, it would also be helpful for your child to complete some tests and practice exercises that are specifically geared towards the 11 Plus exam. Where Can I Get Some Non Verbal Reasoning Practice Questions? Our Free 11 Plus Resources library contains some Non Verbal Reasoning practice questions, so make sure you sign up if you haven’t already done so. Subscribers to our FSL 11+ Online platform will find themselves with a vast quantity of NVR worksheets, tests and video tutorials. 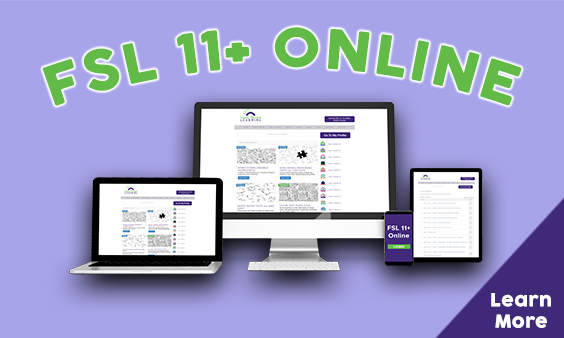 Membership to FSL 11+ Online costs £14.95 per month and includes access to two full 11+ courses (GL and CEM) as well as full practice papers and hundreds of online quizzes.